Each of these three major Church Year festivals has a vigil service on the evening before the festival day. These are times of prayerful waiting and preparation for the joyous celebration of the Festivals. Each vigil service includes readings, prayers, singing and Holy Communion. The Vigils of Easter and Pentecost also include a special emphasis on the Sacrament of Holy Baptism. The most well known vigil here at MLLC is the Vigil of the Nativity of our Lord, also known as Christmas Eve. The Day of Pentecost and its vigil are taking place this month. You are strongly encouraged to participate in both of these unique worship experiences. The liturgical color of both these days is red. Therefore, you are invited to wear RED in celebration of the gift and outpouring of the Holy Spirit. Saturday, May 23 6:00 p.m.
We will hear readings about the Holy Spirit. The congregation will be invited into a deeper time of prayer, including prayer for the newly confirmed youth of the church. “From history, we know that Easter and Pentecost were the first two and only feasts of the original Church Year from apostolic times. We also know that the ancient church celebrated a vigil with Easter as early as the second century and with Pentecost universally from the fifth century, likely earlier in various places. We further know that baptisms were also a part of these services, given its promise of resurrection with Christ and gift of the Holy Spirit. Easter, having the earlier vigil, was clearly preferred, with those not baptized then being transferred to Pentecost. If a baptism occurred at some time other than Easter or Pentecost, it not only was highly unusual, but actually limited access to holy orders in the church. Sunday, May 24 9:00 a.m. The Day of Pentecost of the fiftieth day of the Easter season. On that fiftieth day we celebrate God the Holy Spirit, through whom and in whom the people of God are created and re-created. We give thanks for the dramatic outpouring of the Holy Spirit on the Disciples as they were gathered in one place in Jerusalem. On that day the Holy Spirit came as a rush of violent wind and as tongues of fire on the disciples. They were then sent out by the Spirit to proclaim in various languages the mighty acts of God, specifically the saving work of Jesus through his death on the cross and his rising from the dead. Pentecost is sometimes called the church’s birthday, but might more appropriately be called its baptism day, since the gift of the Spirit is the fullness of baptism. The Arts in Worship on Pentecost are lively. 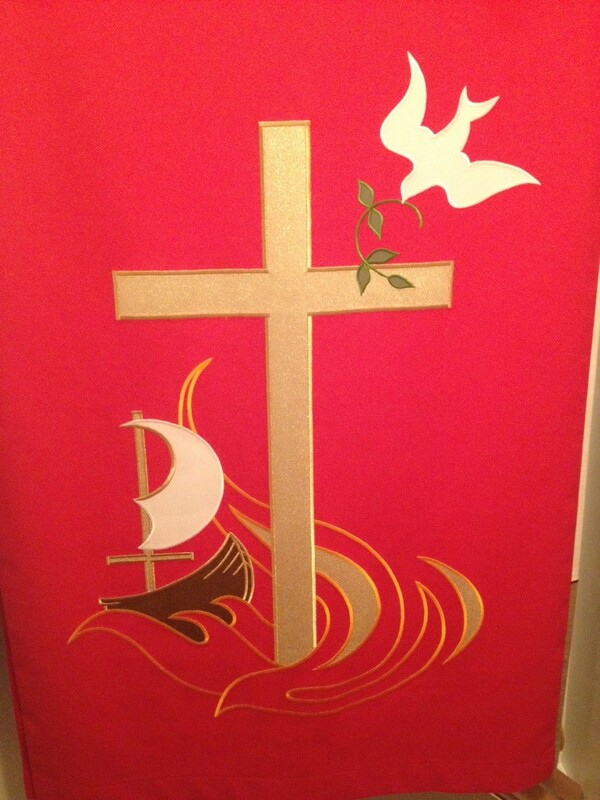 Look for red banners, red paraments, doves of the Holy Spirit on banners, and more. Remember to wear Red on Pentecost Weekend.